We're happy to say that Silver Snakes have announced their new album on their new label, Evil Ink Records (headed by Coheed and Cambria's Claudio Sanchez). It's called Saboteur, is out February 5, 2016, and you can hear the first song, "Raindance", at BrooklynVegan. Pre-orders are available here. 'Saboteur is a record summed up by its title. It's about sabotage, it's about using direct action to accomplish a goal. It can be applied to many situations : Personal, Political etc. it's about having the passion to do absolutely whatever it takes to make a point even if it's potentially harmful. The band will be on the road supporting Coheed, along with Glassjaw, early next year. Check those dates, as well as the Saboteur track listing, below. 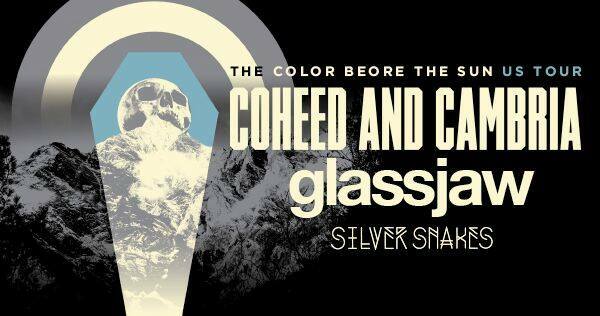 Silver Snakes have been tapped as the opener for Coheed and Cambria's upcoming full U.S. headlining The Color Before The Sun tour in early 2016. Direct support comes from Glassjaw. Check out the full itinerary below. Silver Snakes last released Year of the Snake in 2014. Expect news on the recently recorded followup coming soon.